Springtime! It’s foggy and cold, then you blink and there are buds on the trees and robins in the air. Seemingly in the blink of an eye, it’s also been 2 months since our last product update. Here is what the Jobber crew has been up to in the last 60(ish) days. Our job forms feature allows you to create custom forms and checklists to ensure your team never misses a step, and to help you promise and deliver on high service standards. We’re happy to report that you can now download these forms so you can deliver them to your clients! 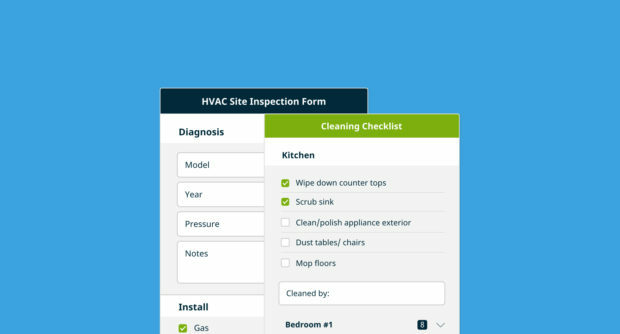 For example, residential cleaners can send customers a complete home cleaning checklist, HVAC pros can send a diagnostic report—job forms are flexible to your needs. When you’re logged into Jobber online on your browser, simply look for the ‘Download PDF’ button on a job form. Rebecca, Su, and Connor talked shop and demo’ed Jobber to HVAC and plumbing pros in Toronto at Canadian Mechanical and Plumbing Expo in March. In a nutshell, there were great conversations with new faces and our awesome customers, and we will be back when the show pops up again in 2020! Linking to a work request form from your website or social media channels is a convenient way for new and existing clients to be able to get in touch with you without having to pick up the phone. 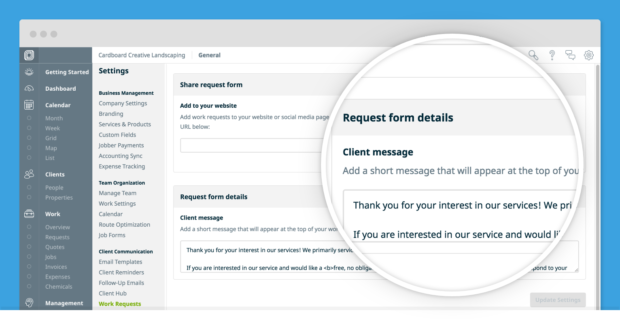 Now you can pop a custom message in before your form fields to provide instructions and manage client expectations. Go to ‘Client Communication’ under ‘Settings’ in your Jobber account to set up your custom work request message, or learn more about work requests. By day, Greg and Tyler run Brothers Pool Service in Scottsdale, Arizona, and any time and energy they have left after running their business goes into the making of the Pool Chasers podcast. They’re building the podcast to grow the pool and spa community, but we have to say there are plenty of takeaways for business owners in any industry. From mentorship, to online reviews, to sharing stories of early business success and challenges—Greg and Tyler are creating really great content. We’re super excited to be sponsors of the podcast! It’s great when Jobber customers are just as excited to build an awesome service business community as we are. We teased this in our February product update, and on March 1st we launched our new day view! It’s now super easy to see when you’re free when talking to a client, and you can simply tap an open time slot to book new work. Learn more about day view. 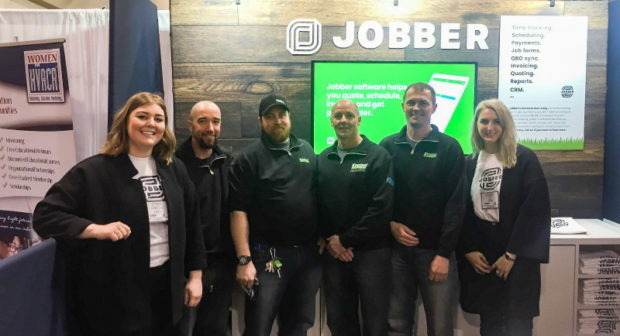 The Jobber crew spent lots of time in Calgary, Alberta in March getting to know our awesome customers, and meeting other service business owners. We took over the top floor of Charbar for an evening of food, drink, and networking. The goal was to help local service businesses build their rolodex of other business owners (to build referral magic, and so you always have an answer when your clients ask if you know a trustworthy arborist/cleaner/painter/etc. ), and give property managers the opportunity to meet service businesses in person. Three industry experts shared advice and proven business strategies over three evenings at our free speaker series. They covered social media strategies, Google ads, and a playbook for opening multiple locations. Check out our ‘YYC Meetups’ story on Instagram for takeaways from all three talks, and watch Katie Pearse, the Maid Mentor, explain how you can turn social media followers into paying customers. And check out getjobber.com/meetups to see where we’ll be next. We opened a ‘Jobber Office’ in Calgary for two days, offering customer training, Jobber demos, and a lunch hour workshop covering the cash flow habits of successful businesses. We even had a group of customers join us bright and early for a focus group on the future of scheduling. Their insights will help us shape future Jobber features! If you’re curious about where in the world the Jobber team will be heading next, visit our Jobber Meetups site or follow us on Facebook, Twitter, or Instagram for future event announcements. Need to quickly add a photo or important document for your client to fill out? Adding attachments to client emails is now easy peasy. Simply drag and drop files into an attachments section in our email template and you’re good to go. 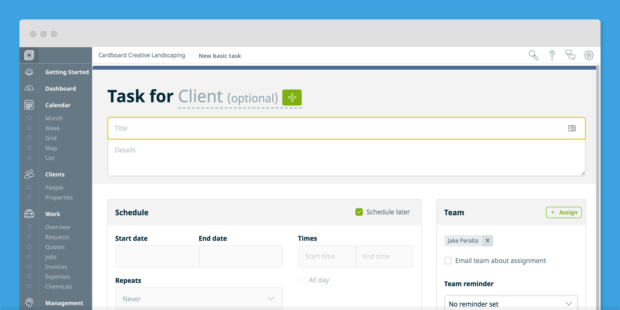 Learn more about client communications in Jobber. When you’re dealing with appointments and client requests it goes without saying that you’re going to have lots of calls, meetings, estimates, and other important tasks on the go. Enter Jobber’s ‘task’ feature to help you track your to-dos. Now when you create a task from any point in your Jobber account, you can easily associate it with a specific client or property. 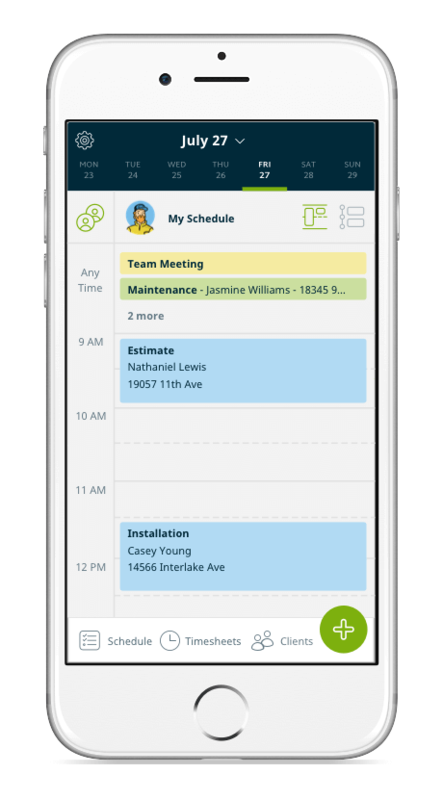 Set a start and end date and time, and Jobber will remind you when tasks are overdue. We teamed up with Dirt Monkey University for a three part video series that dives into how you can radically change your business in 30 days. Stan ‘The Dirt Monkey’ Genadek and Phil ‘The Professor’ Sorros take you through the proven strategies and tactics they’ve used to add value to services—and be able to charge more. That was March and April at Jobber in a nutshell! As always, if you have any questions, feel free to reach out to our Success team through in-app chat, email [email protected], or give us a shout at 1-888-721-1115.